By the end of August, we are always sad here in the office that our busy field season is coming to an end. 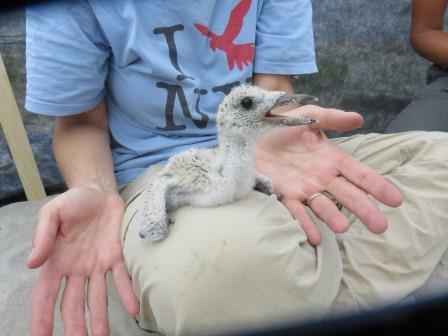 Our American oystercatcher chicks have fledged, there are no more herring gulls to band on the green roof of the Javits Center, and our great egrets are already off and flying around Jamaica Bay. 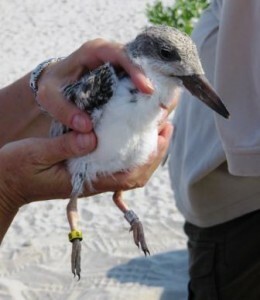 That’s one reason why, when asked to help band black skimmer chicks out at Nickerson Beach in Nassau County, Long Island, just outside our territory, we jumped at the chance! With John Zarudsky and his crew from the Town of Hempstead, along with Jason Smith and his team from NY State Department of Environmental Conservation (DEC), we headed out early Tuesday morning to the colony of approximately 600 pairs of skimmers on Nickerson Beach. The plan was to quickly set up a drift fence at the edge of the colony to act as a boundary, to prevent the chicks from running out of the colony where they could fall prey to gulls. Once we set up, it worked better than we could have expected. Within a few minutes, we were able to herd close to 100 chicks inside the u-shaped fencing. We closed off the opening in the fence, turning it into a pen with the chicks inside. The adults stayed nearby while we quickly banded the chicks, releasing them back into the colony as soon as they were banded. The chicks, fast runners but still not able to fly, resemble drab versions of the adults, and lack the unique bill that make skimmers unmistakable. At three to four weeks old, chicks have a large bill, but it is still dark and the length of the top and bottom are still equal. With age, the lower mandible will eventually grow longer than the upper. Each chick was banded with a US Fish & Wildlife metal band on its left leg, and those with big enough legs received a bright yellow field-readable ID band on their right leg. There were a few thin-legged chicks whose yellow bands slipped right off their feet! The plan is that the Town of Hempstead will find out where their skimmers are going during the rest of the year, and to see how many chicks return as adults to breed in their natal colony. In all, we were able to band over 80 skimmer chicks in a matter of a few hours—no small feat given that without the fence, this would have taken several days to accomplish. 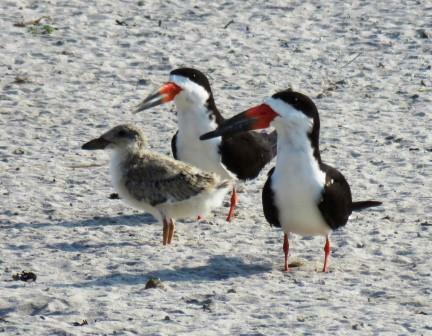 While we were there, we didn’t see any gulls or any aggressive encounters with territorial adult skimmers, and young birds were soon reunited with their siblings and parents—a good sign for young chicks, which can become easy prey for gulls or aggressive neighbors. It was a rewarding day working with our colleagues at the DEC and Town of Hempstead (and the skimmers of course), and a successful end to our summer field season.